Happy 2018! Once again, I am participating in the Pet Blogger Challenge hosted by GoPetFriendly.com. 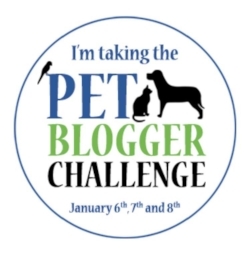 As always, the challenge is a great way to learn from and support fellow pet bloggers. I have been blogging on and off since 2011. I originally started the blog with my dog Pip as a way to raise money for his rescue shelter. When he passed away in 2013, I wasn’t sure I wanted to continue without him. I returned to blogging in 2015 with our new dog Ruby, but kept the original name in Pip’s honor. The Daily Pip is an eclectic mix of inspiring rescue and adoption stories, personal reflections on my life with animals and midlife comeback, and a whole bunch of random furry cuteness. First and foremost, I blog about rescue animals, my own as well as others I find inspiring. I am a huge advocate for animals with special needs and those viewed as less adoptable: seniors, those with chronic medical conditions, behavioral or temperament issues, as well as misunderstood pets like pit bulls and black cats. Bottom line: I want more people to adopt and I want to broaden the definition of what makes animals adoptable. Without a doubt being nominated and winning a Maxwell Medallion from the Dog Writer’s Association of America for my post Does Your Rescue Dog Have Issues (Or Do You)? I was also a finalist for two BlogPaws Nose-to-Nose awards for Best Cause Blog and Best Dog Blog. Another big moment in 2017 was leaving my day job. I don’t make tons of money directly from my blog, but blogging has led to other writing opportunities and I now work from home. My two favorites are The Specials: Adopting a Deaf Feral Cat and When Your Dog Is Socially Awkward (And So Are You). Both are personal posts about my life with animals (one serious and one funny) and best represent my range as a writer and overall mission of the blog. I measure success by making a difference for rescue animals. This year I raised over $3,000 for shelters and rescues as well as individual animals in need. I also received several lovely emails from readers who were inspired to adopt special needs animals after reading my blog. Two of my favorites were a family who adopted a deaf injured dog and a long time reader who (after following Pip in our early blog years) has rescued multiple hospice, senior, abused, and special needs Yorkshire terriers. This is what it’s all about for me. My blog has become more personal this year. Although I still focus on rescue and adoption, I am now sharing more about my own life with animals. 6. What was your biggest blogging challenge in 2017, and what did you learn that could help other bloggers? I went through a rough patch from May-July where I wasn’t feeling inspired and didn’t post very often. But I re-focused in August and since then have written some posts I am really proud of and are among my best posts to date. My biggest piece of advice for overcoming writer’s block is not to fight it – trust that your inspiration will return when the time is right. Sometimes we just need a break, but everything eventually comes full circle. 1. I am stubborn as hell and don’t give up easily. 2. My twelve-year-old daughter is really proud of my blog and I don’t want to let her down. 3. Supportive comments and emails from readers who find my blog inspiring and have adopted special needs animals. 4. My blogging accountability group that keeps me focused and on task. 8. Looking forward to 2018, what do you hope to accomplish on your blog this year? I want to take my storytelling to the next level and also find ways to use my blog to raise more funds for shelters and rescues. Additionally, I am also going to be bringing back my Specials series, but focusing exclusively on senior adoption. 9. In addition to what you would like to accomplish, is there one skill you would like to improve or master this year? In an ideal world, get more comfortable with live video (I am hopelessly socially awkward so this probably won’t happen). In the real world, build my email list and improve my game on Instagram, posting more consistently and intentionally. 10. Is there a question you’d like answered, or an aspect of your blog that you’d like input on? This year I am focusing on building my writing portfolio and looking for opportunities to write for other sites and/or publications. I would love tips on pitching story ideas and/or suggestions on potential sites/publications. Thank you! I’m looking forward to reading everyone’s posts! Unfortunately, I have no advice for pitching guest posts. I've made writing guest posts a goal for this year as well, so I'll be coming back to this thread to see what words of wisdom you receive from the blogger community. I am considering looking outside of the world of pet blogs. I've got it on my list to find midlife lifestyle bloggers and see what kind of content they produce. See if there are any opportunities to contribute some pet wisdom within their blogosphere. Wishing you, Ruby, Rosie, Lulu, Cranberry Cookie, and your family a healthy and happy new year! We've been able to raise a few dollars here and there for some of the service dog organizations we volunteer for, but nothing close to $3,000! That's awesome! Yikes, I haven't tried live video yet, but I'm considering doing Facebook live I just have to overcome the fear. Unfortunately, I have zero experience pitching story ideas. Sorry no help there. All the best to you in 2018! We enjoyed reading your responses. We love your blog and look forward to what you do this year. We are so proud of the great things you are doing to help critters everywhere and your posts are always top notch. We enjoyed reading your responses. My mom always says not to force it, it will come when we are short on blog ideas, and it always seems to come. If you don't stress out about things, the ideas seem to come all by themselves, and with your variety of pets and causes, something must be happening all the time. Enjoy what you do, and people will notice. We don't have any ideas on guest posting as we have never pitched others, but others have come to us. Keep on blogging, you are doing great! I admire anyone who can raise that kind of money, Go You! And bringing awareness to special rescues like you are is huge. I have no ideas for pitching anything, I'm in that socially awkward group too. The Pet Blogger Challenge 2018 was a great way to get introduced to your blog! Congratulations on your Maxwell Award! Thank you for your work on behalf of animals who can be difficult to adopt. I have a special interest in senior adoptions myself.Take care! That's wonderful that you've raised so much money for rescues! With two reactive dogs and a cat with chronic health issues, I'm always happy to see people promoting those types of pets! Looks like you have so much to be proud of in 2017.As for pitching stories, the best help comes from others who are doing it. I follow some great sailing sites on Facebook and some of them have specialty groups, like one to help sailing writers.If you search around, you might find a FB group for pet writers. Or perhaps you could talk about starting one through BlogPaws. You have found a great balance between your work helping rescues, and your personal stories. I enjoy both. You have certainly had a lot of success, and I am not qualified to give you advice – LOL. Plus I've never pitched a guest post 🙂 I feel pretty sure you'll do quite well at it though! WE truly admire you blog and love all the rescue stories. The rescued animals are so important. Your goals are wonderful. You have a wonderful Sunday. Ha, I'd love that too 🙂 I think it depends on whether you want to get paid or not. Many blogs are open to guest posts, including mine. Nice to learn more about you. You do an amazing job helping promote rescue. I love that you've been able to raise so much for your shelter. Your December countdown project really got me thinking of ways I could better support the shelter I volunteer with. I also am grateful for an AMAZING accountability group. As someone else who is passionate about advocating for rescues, I heartily applaud your efforts. Gold star for you! ⭐️ Continued success in 2018. I love that you advocate for rescue animals even those deemed , 'unadoptable'. when I'm ready for my next dog, it will more than likely be an 'unadoptable. 'I don't usually take unsolicited guest posts on my blog, but the one time I did her pitch to me was perfect. She sent me a very nice letter and included the post with it. I can't remember her exact words but I think it went something like, "I've written the enclosed post which I think would be a great fit for your blog and readers." I get lots of pitches but this one worked because I had the control on it. Wow! Being able to quit your day job thanks to your blog is amazing! Congratulations! You already know how much I adore you, your blog and advocacy. I always enjoy learning more and somehow these challenges always do that too. I don't have an answer to your question but would love to help with the Specials series and fund-raising in any way I can! Ruby, Rosie, Lulu and Cranberry Cookie are all adorable! I love the design of your blog; it's super cute! Thank you for everything that you do! Congratulations on an absolutely fantastic 2017! You're doing great things and have a lot to be proud of – being able to start working from home his HUGE.To make your pitches stand out, I recommend targeting handful of blogs that make good sense for your niche. Then, check to see if they've published guest posting guidelines. When you finally reach out, pitch an article that compliments their topics, but they haven't already published, and let them know if you're planning to link to businesses or back to your own blog. So many freelance writers provide "free content" but they're being paid by a company who they're going to link to in their post. Eliminating those concerns will definitely get an editor's attention. Thanks so much for taking part in the Challenge, and all the best to you in 2018! I've noticed a lot of changes in your blogs since I first discovered it. You definitely had a great year, congratulations on that. I love what you do to promote adoption and I think it's a real niche you have. I've been worried that your blog was going to become too commericial with lots of branded content so I'm glad to see it hasn't. Good luck in the new year! Sandra and Dolly PS: What, no goal for a meet up with Dolly? I'm so glad you joined the challenge and posted this. I feel I know you much better now. I'm so happy that things are working out so you can stay home and focus on you animal work and your writing. All the best for the new year to you, and your family. I know Ruby was a very lucky girl to end up with you. I often think that. And, yes, Ruby has now become a dog one thinks about every now and then. Just like Pip was. Must have something to do with you…..